Be selective. Choose book switch large, clear, bright, realistic, but cheerful illustrations (some very beautifully illustrated books are too abstract, cluttered, dark, or sophisticated for a toddler to appreciate) and short and simple text. Though most toddlers prefer rhyming books (even if the words don’t mean much, the rhythm is appealing), now is a good time to start introducing some very simple stories in prose. heavy boards books, preferably with sturdy spiral bindings, are ideal for your toddler ‘to read’ alone; keep the more delicate paper books for supervised reading sessions. Skip cloth books, which don’t seem to bear enough resemblance to the real thing to satisfy most toddlers. Vinyl books are fine for the bathtub (often a good time to get a little reading in), but be sure to dry them thoroughly after each dunking to prevent mildew from taking hold. Be persistent. Many toddlers do little but squirm the first few times they’re read to, but persistent usually pays off. Establish a regular story time at least once a day (after the bath and before bed is best); if you have time in the morning, a cuddly reading session in your bed can be nice, too. Even if it lasts just a few pages, and even if your toddler seems more interested in puttering, with a new toy or climbing on and off the bed, story time will ultimately become a cherished ritual – one that you’ll both continue to treasure long after your child becomes capable of reading to him or herself. Never force your toddler to pay attention to a story while you’re reading it. This will make listening seem more like a chore, less like a pleasure. Be creative. You know what interests your toddler better than a book’s author does. So don’t feel obliged to read the words precisely as written; taking literary license can greatly enhance your toddler’s listening pleasure. Abridge long passages, swap simpler words for those your toddler doesn’t understand, drop in commentary and explanations are needed. If the text of a story seems to be leaving your toddler’s cold, concentrate on the illustrations (‘Look at that big dog and that little dog’ or ‘I wonder what’s in the little girl’s basket’). Be expressive. No one likes to listen to a monotone. But to a toddler who’s just picking up the nuances of language, an expressive reading style makes listening not only more enjoyable, but also more comprehensible. So ham it up. Be repetitious. Toddlers love to hear the same story over and over again; and though the repetition may drive you to distraction, it’s incredibly satisfying to young ears. Especially if the text is in rhyme, you may be surprise to find after a while that your toddler has memorized some of it. Be brief. 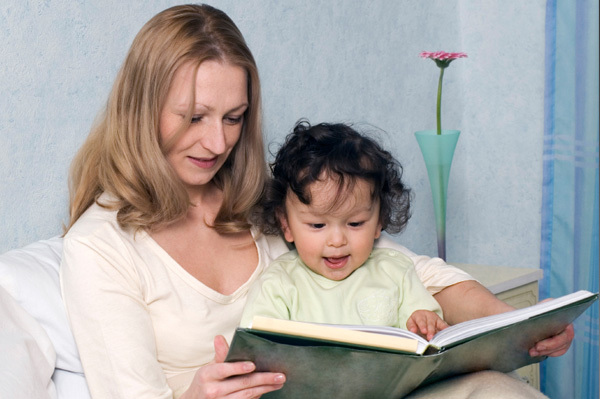 Short books and short reading sessions sit best with a toddler who can’t sit still. Go form page to page and idea to idea quickly – to keep restlessness from setting in, and your audience from wandering off. And be ready to end story time after just a few minutes; if need be. Be cuddly. Children who come to associate reading with the cozy comfort of being curled up on Mummy or Daddy’s lap, almost always enjoy reading books later on. Be a good example. Children of readers are much more likely to end up readers themselves. Try to set time aside each day for your reading – even of you manage just a page or two at a sitting. If you can’t fit this into your schedule, or if you just don’t like to read, make sure your toddler sees you reading at least occasionally. Make reading material a fixture in your home; keep a book try your bedside (‘This is Mummy’s [or Daddy’s] book’), magazines on the coffee table, newspaper next to your armchair. And minimize the amount of television that’s watched by your toddler and by you. Studies have shown that families, who watch less, read more.